As you work with selections, you might find times when the selection capability doesn't match your need. For example, the Elliptical Marquee tool can certainly make oval selections, but those ovals are either vertical or horizontal. What if you need an oval selection at an angle, such as what you see in Figure 8-14? That's where the SelectOTransform command comes into play. Make your initial selection, choose the Transform Selection command, and then manipulate the selection to fit your needs. In Figure 8-14, you see that the selection is not just rotated but is also skewed and distorted slightly. You can manipulate a selection any way you please with Transform Selection. (Okay, well, you are limited to two dimensions — you can't make the selection come forward out of the monitor onto your desk.) Consider Figure 8-15 to be your roadmap to transformations. Figure 8-14: With Transform Selection, you can manipulate the selection itself. Figure 8-15: The many faces of transformations. i Top left: This is the original selection. i Top center: Click an anchor point on any side of the bounding box and drag to change the height or width of the selection. i Top right: Position the cursor outside the bounding box and drag to rotate. i Middle left: Drag any corner anchor point to manipulate the selection's width and height at the same time. i Middle center: Hold down the Shift key while dragging a corner anchor point to avoid distorting the selection while changing size. i Middle right: Hold down the Option/Alt key while dragging a corner anchor point, and you end up scaling the image based on that crosshair in the center of the bounding box. (You can drag that crosshair anywhere, even outside the bounding box, to change the point of transformation.) You can use the Shift key with Option/Alt, too. i Bottom left: Hold down the ^/Ctrl key and drag any side anchor point to skew. i Bottom center: Hold down the ^/Ctrl key and drag a corner anchor point to distort. i Bottom right: If you ^/Ctrl-drag two or four corner anchor points, you can add perspective to the selection. 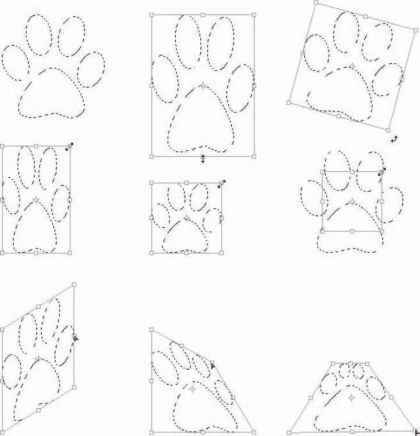 I might, for example, fill this transformed selection with color, move the selection, scale it down a bit, fill again, and repeat a number of times to create a series of paw prints marching into the distance.